Yoga teaches us that every moment we exist is a practice. It’s a breath practice, a balance practice, a practice in being present in our bodies, and a practice in taking it all in and moving forward. Yoga helps us center and become fully engaged students of life. Every difficult pose is a chance to push through our limitations and learn more about ourselves and our surroundings. 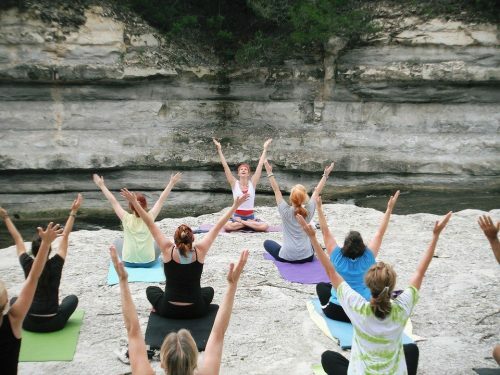 With this attitude in mind, it should come as no surprise that many students of yoga have a free-spirited and holistic approach to self-development and learning. They are drawn to alternative education programs like yoga teacher trainings, which foster their inner growth and allow their beings to radiate out into the world. They recognize that education is about more than memorizing facts for exams, it’s about integrating new experiences and perspectives, cultivating inner wisdom, and putting it to work. What Does it Mean to be a Student of Life? Curiosity. We’re all born with it. But all too often the daily grind has a way of dulling that sense of curiosity. If the path is too perfectly defined, a person’s sense of hunger for knowledge often dissipates. Why work hard in school if you know that a D grade will pass you onto the next grade level? Why work extra hours in your job if you know you’re not going to get compensated for it? The answer of course is because of a thirst for knowledge and achievement. That inner quality is the foundation for success as a student of life. It’s about doing things for your own enrichment rather than to meet external forces. Being a student of life means approaching every challenge as an opportunity for personal growth and reflection. It means actively seeking out new adventures. It also means actively choosing how you want your life to be rather than just letting it happen to you. That idea can sound a little trite on its own, ripe for a JP Sears satire, but I like to think of it this way: The things that life throws at us — challenging jobs, loss, social pressures — are all outside forces pushing us around. But a person who is intent on self-reflection and self-direction is continually building up strength in order to hold their own and steer their own ship. We do the same in yoga. It’s all about training our muscles, breath, and mind to resist the pressure. One of the challenges of the “student of life” philosophy is finding a way to balance your inner goals and ambitions with the nuts-and- bolts realities of life. College, because of the expense, is one of the most talked about challenges that people today face. On the one hand, a college diploma is the new high school degree; a near-necessity in today’s job market. On the other hand, it can be hard to justify spending tens-of- thousands of dollars and taking four years out of your life just for a piece of paper. A person who is a student of life becomes quickly adept at finding creative ways to balance their inner goals with the rest of life. Yoga teacher and Arizona State University student Natalie Sparaccio is an example of a typical millennial student of life. After high school, instead of jumping straight into four years of college, Sparaccio went into the working world. After a few years working, she decided it was time to go back to school. Instead of dropping all the accomplishments and responsibilities she’d collected over the years — teaching yoga, working as a barista, and doing freelance photography — she chose a college program that would allow her to continue focusing on her long-term goals. There’s a reason why millennials are known for having several side-gigs; it’s because passion projects are so often the first steps to fulfilling lifelong dreams and purpose. Generation by generation, our society is getting better at seeing the value of inner work. Once a student of life has a handle on the balancing act, the next challenge is to really prioritize applying your inner calling and passions in the everyday. This might manifest in a whole bunch of different ways, from attending regular yoga retreats to signing up for a yoga teacher training, but no matter the means, the purpose behind it all is to support the fire within by dedicating time to it. In the same way, whether you choose to integrate your practice by diving deeper into the role of either student or teacher, the road starts with your own personal practice. Immersing yourself in a yogic lifestyle for a regular, dedicated period of time will only serve to kindle your inner flame and advance your purpose. The decision to make yoga your livelihood by opening a studio or offering classes is entirely up to your inner guidance. There is one thing a student of life will never experience: graduation. No matter how advanced a student of life becomes, they will always be a student. The Art of Parenting Book Review and Giveaway! Care/Of Customizable Vitamins20 Minute Pilates Theraband Routine!